President-elect Donald Trump became the 45th president of the United States at noon when he was sworn in by Chief Justice John Roberts. While the oath took only a minute to administer, a full day's worth of events were planned to celebrate the momentous occasion, from prayers to musical performances -- and the highly-anticipated inaugural address. U.S. President-elect Donald Trump acknowledges supporters with his wife Melania at the "Make America Great Again! Welcome Celebration" at the Lincoln Memorial. in Washington, U.S., January 19, 2017. Toby Keith performs at the "Make America Great Again! Welcome Celebration" concert at the Lincoln Memorial in Washington, U.S., January 19, 2017. U.S. President-elect Donald Trump and his family take part in a Make America Great Again welcome concert in Washington, U.S. January 19, 2017. U.S. President-elect Donald Trump and his wife Melania take part in a Make America Great Again welcome concert in Washington, U.S. January 19, 2017. Lee Greenwood performs with the Frontmen of Country during the "Make America Great Again! Welcome Celebration" at the Lincoln Memorial on the eve the inauguration of President-elect Donald Trump in Washington, U.S., January 19, 2017. U.S. President-elect Donald Trump son Donald Trump Jr. (C) looks at his daughter Kai Madison as she takes a picture with her mobile phone during the Inaugural Concert at the Lincoln Memorial in Washington, U.S., January 19, 2017, one day before Trump's inauguration as the nation's 45th president. 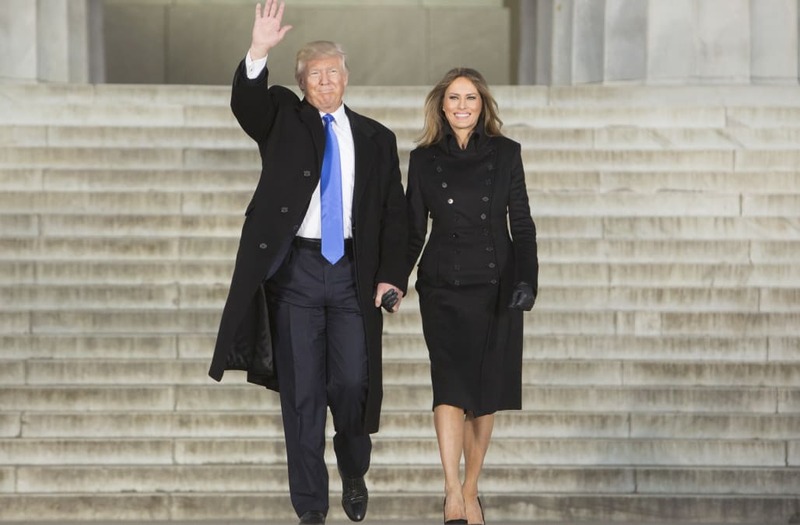 President-elect Donald J. Trump and wife Melania Trump arrive for the inaugural concert at the Lincoln Memorial in January 19, 2017 in Washington, DC. Hundreds of thousands of people are expected tomorrow for Trump's inauguration as the 45th president of the United States. Brad Arnold of 3 Doors Down sings during the "Make America Great Again! Welcome Celebration" concert at the Lincoln Memorial in Washington, U.S., January 19, 2017. U.S. President-elect Donald Trump salutes next to his wife Melania (C) and daughter Ivanka as they arrive at the "Make America Great Again! Welcome Celebration" at the Lincoln Memorial. in Washington, U.S., January 19, 2017. The U.S. Army Band performs during the "Make America Great Again! Welcome Celebration" at the Lincoln Memorial on the eve the inauguration of President-elect Donald Trump in Washington, U.S., January 19, 2017. U.S. President-elect Donald Trump gives a thumbs-up at the "Make America Great Again! Welcome Celebration" at the Lincoln Memorial. in Washington, U.S., January 19, 2017. Members of the American Tap Company perform at the Voices for the People inaugural musical event on January 19, 2017 in Washington, DC. President-elect Donald Trump will be sworn in as the 45th U.S. president on January 20. U.S. President-elect Donald Trump arrive with family members at the "Make America Great Again! Welcome Celebration" at the Lincoln Memorial in Washington, U.S., January 19, 2017. People stand for the national anthem before U.S. President-elect Donald Trump arrives at a Make America Great Again welcome concert in Washington, U.S. January 19, 2017. Members of the American Tap Company walk offstage after performing at the Voices for the People inaugural musical event on January 19, 2017 in Washington, DC. President-elect Donald Trump will be sworn in as the 45th U.S. president on January 20. Jared Kushner, the son-in-law of President-elect Donald Trump, along with his wife Ivanka Trump arrive for the the Inauguration Welcome Concert at the Lincoln Memorial January 19, 2017 in Washington, DC. Hundreds of thousands of people are expected tomorrow for Trump's inauguration as the 45th president of the United States. Members of the Emerald Society, Washington, DC Fire Department band, walk on their way to perform at the Voices for the People inaugural musical event on January 19, 2017 in Washington, DC. President-elect Donald Trump will be sworn in as the 45th U.S. president on January 20. President-elect Donald Trump speaks at the Lincoln Memorial January 19, 2017 in Washington, DC. Hundreds of thousands of people are expected tomorrow for Trump's inauguration as the 45th president of the United States. U.S. President-elect Donald Trump daughter Ivanka (C), her husband Jared Kushner (R) and Tiffany Trump arrive at a Inaugural Concert at the Lincoln Memorial in Washington, U.S., January 19, 2017, one day before Trump's inauguration as the nation's 45th president. A military band performs during a welcome celebration for US President-elect Donald Trump and wife Melania at the Lincoln Memorial in Washington, DC on January 19, 2017. Supporters of U.S. President-elect Donald Trump attend an Inaugural Concert at the Lincoln Memorial al the National Mall in Washington, U.S., January 19, 2017, one day before Trump's inauguration as the nation's 45th president. A supporter of U.S. President-elect Donald Trump attends an Inaugural Concert event at the Lincoln Memorial al the National Mall in Washington, U.S., January 19, 2017, one day before Trump's inauguration as the nation's 45th president. President-elect Donald Trump speaks during the inauguration concert at the Lincoln Memorial January 19, 2017 in Washington, DC. Hundreds of thousands of people are expected tomorrow for Trump's inauguration as the 45th president of the United States. Guests cheer during the inauguration concert at the Lincoln Memorial January 19, 2017 in Washington, DC. Hundreds of thousands of people are expected tomorrow for Trump's inauguration as the 45th president of the United States. President-elect Donald Trump looks on during the inauguration concert at the Lincoln Memorial January 19, 2017 in Washington, DC. Hundreds of thousands of people are expected tomorrow for Trump's inauguration as the 45th president of the United States. Trump, Pence and their families will attend a morning service at St. John's Church. They will be joined by leaders of all religious faiths. Trump and his wife, Melania, as well as Pence and his wife, Karen, will meet President Obama and first lady Michelle Obama at the White House for tea. Obama and the first lady will accompany Trump, Pence and their wives in a motorcade from the White House to the United States Capitol. Donald J. Trump will be sworn in as president and Mike Pence will be sworn in as vice president on the West Front of the Capitol. Trump and Pence will attend a luncheon hosted by the JCCIC the Capitol. A tradition that dates as far back as 1897. Trump and Pence will meet with military leaders at the Capitol. Trump and his family and Pence and his family will lead a parade that runs down Pennsylvania Ave. from the Capitol to the White House. An estimated 8,000 people from all over the country will participate in this year's parade. Trump and Pence, accompanied by their families will attend three inaugural balls. They will first make their way to the Walter E. Washington Convention Center for the Liberty and Freedom: The Official Presidential Inaugural Balls, followed by the Salute To Our Armed Services Ball.